"They are about an inch by  inch and look like little red pin pricks with no feeling or discomfort." Charlene was a 32 year old Human Resources Assistant living in England when a strange grid mark appeared on the fronts of both her shoulders in July of 2015. In fair health with no daily medications, she went to bed and woke without a break in her routine. Nothing seemed out of the ordinary. There was no dream she could recall, no unusual feelings upon waking, no disturbances while she slept. For all intents and purposes, it was like any other day and night. 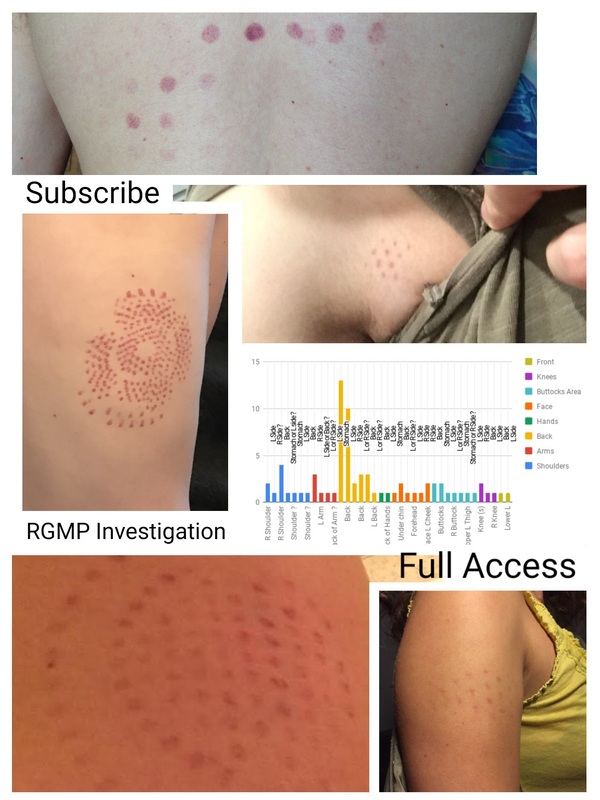 Yet when she woke the next morning, she noticed these painless grids on her body. Rather than jump to conclusions, she searched her bedding. Because the pattern didn't seem to match anything she was wearing, she went to the internet for help. She describes herself as "easy going, organised, prepared and logically thinking" as well as "skeptical, curious, open-minded, [and] creative." Everything I could gather about her confirmed her self awareness. Her answers were concise and left little room for interpretation. Indeed, she was so level-headed in her thinking that although she was inclined to search online for answers, her proposed reason for the mark was maybe she "slept on something, like a bag or top." A stark contrast from the terror-stricken emails and comments our site usually receives about this phenomenon. If you've filled out our questionnaire, you know many of our questions allow for self-description --answers in your own words-- rather than lead or pigeon-hole you with limited lists of choices. We tried to keep it open-ended because we want experiencers to give us their own thoughts and descriptions. Charlene's overall succinct, if not apathetic, communication was underscored by the rationalism in her responses. She provided specific details about her marks more so than theories. In fact, the only real interpretation she offered was in the description of the physical marks themselves. She was interested in reporting what she knew for sure, and because she didn't know the cause, she wasn't about to run off worrying herself with speculation. Measuring 7 rows x 7 columns at either extreme, a grid of pin-prick dots was found on each shoulder. Each dot is estimated to be an inch apart from the next. They remained visible for over 15 hours (at time of submission). Rarely we receive precise measurements and spacing. Thank you Charlene, for what it's worth. If you wish to learn more about our theories, cases, data, and conclusions, visit our STORE. Know of an unexplained grid mark? Use the links provided in the left hand column to access our survey and contact form. Email us your photos at experientialdreamingatgmaildotcom.